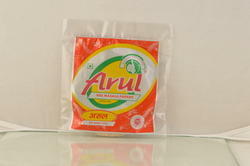 Arul Appalam Depot is one of the most trusted applam and pappadum manufacturers based in Chennai (India). 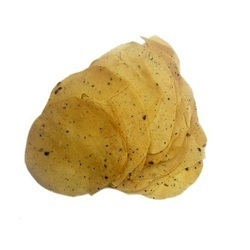 We are known across the nation for mouth watering Papads that are rich in taste and ensures health benefits as well. We ensure that all the papads are carefully manufactured in our in house processing facility which is very hygienic and packed using clean packaging material that ensures the product safety and cleanliness even during the transit as well. 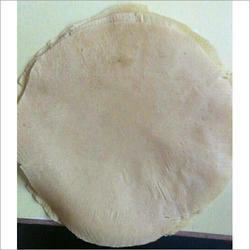 We offer a wide variety of Designer Papads that are very tasty and ensures quality as well. Complete care is taken towards its hygienic preparation and only the best ingredient are used in its manufacturing. Ensuring delectable taste, these can be made available from us in different variety at cost-effective prices. 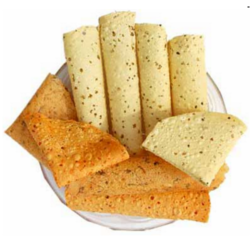 Garlic Sesame Papads are an important part of Indian cuisine with recipes varying from region to region and family to family considering the diversified cross culture of India. 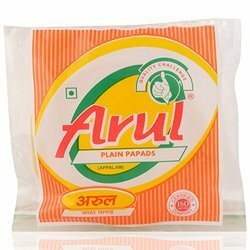 We are one of those companies in India, which has mastered the excellence of Papad making as per the taste preferences of diversified people living across India. Our papads are not only in high demand in India but also share great market in the other nations of the world as well. The Coriander Leaf Papad that we manufacture is widely appreciated amongst our clients from the states of Tamil Nadu and Gujarat owing to its sumptuous taste and rich aroma. We are one of the renowned manufacturers of tasty Mint Papad/Appalam/Poppadom, which are made utilizing age old tried and tested culinary practices and recipes. These ensure delectable taste and unmatched quality and hence have become part of one’s daily diet. Available in different variations, these are offered to our buyers at industry leading prices. This variety of Indian Mixed Veg Masala Papad, and tested culinary practices that are age-old and carry years of tradition and authentic taste. A fine culmination of a variety of masala and tradition, these are very tasty and can be served with a variety of dip that makes it even tastier. 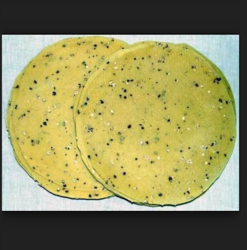 We offer a qualitative variety of Plain Papad/Pappadam that is a part of every Indian meal and its consumption and way o cooking might differ from region to region. We have expertise in manufacturing a variety to suit every region’s taste buds and hence all the variety that we have on offer find great demand across the nation.